John le Carré’s 1963 novel The Spy who Came in from the Cold made famous the phrase “to come in from the cold.” The cold refers to living undercover or as a spy, or in an environment of hostility, surrounded by adversaries with cold feelings. Life in the cold is meant to be a hardness to others, a lack of empathy or compassion. 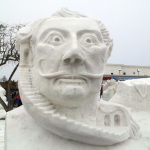 The cold front around here has moved on, timed perfectly for the completion of the Snowfest in Frankenmuth. Going out in the rain in January doesn’t quite give the warm fuzzies. In the greatest spy novel, coming in from the cold seems an impossibility. It requires an excellent pension and then corrosion of the man or woman who has been “put on the shelf.” The best games are played in the cold. You just have to keep moving to stay warm. The great coach of the Minnesota Vikings, Bud Grant, once said players who are not in the game shouldn’t have heaters to keep them warm. He didn’t want his players to feel comfortable watching from the sidelines. The spy returns to the cold, now in battle with Control (his bosses in London) and the Communists on the other side of the Berlin Wall. The watchtower’s searchlight sweeps across the Berlin Wall and sirens wail and shots are fired. His companion, the girl, is struck with bullets and falls so close to the Wall. He is safe but he has lost her. The girl, where’s the girl? He climbs back down the Wall into the cold to die with the girl. We’re now in the Age of Empathy according to Harvard psychologist Steven Pinker who is a perennial on those Top 100 Thinker lists. He credits self-control and empathy, coming in from the cold so to speak, for the decline of violence and the rise of our better angels. But he also writes in The Better Angels of Our Nature that life can’t be warm and fuzzy feelings all the time. A cold spell every now and then is healthy. A healthy presence of police also helps. While homicide rates continue to decline in New York and Washington, the murder rates are going up in Chicago and Detroit. I thought the constant threat of terrorism helped Washington and New York. Those cities seem to have cameras everywhere. There’s not enough left in Detroit to prevent the homicides. Control is in charge of John le Carré’s novel. The manipulation is deft, more subtle in his pages, with Big Brother always observing. Secrecy News is a good website for staying informed of what the government is doing these days. The site is a Federation of American Scientists publication. Their latest post might explain the drop in crime: “The number of inmates under the Bureau of Prisons’ (BOP) jurisdiction has increased from approximately 25,000 in FY1980 to nearly 219,000 in FY2012.” Secrecy News also reports that the Pentagon has doubled the number of lie detector tests in the last ten years. In an experiment explained in The Better Angels, users of a garage rock band website followed the herd when able to see the number of times a song had been downloaded. The popularity of a song created a positive feedback loop, distorting the difference between hits and duds. When users were blocked from knowing the number of downloads, the popularity gap was much smaller. Pinker explains that these emotions are contagious. The Department of Defense and Homeland Security have provided funds for research on “social diffusion events” and the ability of individuals to influence their social networks. In other words, lead an uprising that might spoil the Age of Empathy. The fog and rain were brutal on the late night drive home from the land of the Amish and farmers in northern Michigan. Cars were on the side of the highway with flashers. The night so dark and fog so thick, you couldn’t see the road. I was determined to follow the lights of the vehicle in front of me. If he went into a ditch, I was coming in right behind him. I wanted winter to be cold again. Staying warm in the cold is easier than living in a fog.